Predicting the future just ain't what it used to be. The reason the Seminole Indian Rain dance worked is because they never stopped dancing. The harder they rocked, the luckier they rolled; and they got the bonus plan, the Hard Rock Cafe franchise, at least for now. The Jean Dixon effect of constant never ending prophesying works too: Even a broken clock is right twice a day. Forget the crystal balls, look at the Yupsters---we don't watch TV or read a newspaper. We are TV. We are newspapers. We're involved. I had intuition about Pulp(less) fiction and the future of paper .The truth would set me free but first it would piss me off. Volunteering. It doesn't pay. You mean, the best things in life aren't things, they're people? Does that mean the one with the most toys still dies? Are we after all, human beings and not human doings? Whatever happened to "The nail that stands up is not getting pounded down , it drives a BMW and has stock options." Oh, Lift Ticket, he got a third round layoff, his stock package became a severance one, and he's no longer seeing a financial analyst but a psychoanalyst. Write? Right!The permanent press is not so permanent anymore. Who would have know that one day we would be eating at gas stations, and 'folks just like us" could add stories, comment or write a column with Digg and Newsvine. Almost famous, not being someone, but no one in particular. They, the anonymous no one. I wanted my 15 megabytes of fame. Someday, someone of great importance would say to me, "You get paid for this?" We don't need PowerPoint to explain that there is no there there, when talking about the future anymore. Unless you take your analog eyes and see a digital world. Real time. Conversational access. Peer-to-peer connections. It's transparent. It's Ubiquitous interactivity, everywhere and everything--hence Hotel @nyware, Ed Reif's blog on the hype buzz spin of 2007 . Markets are conversation. Blogs are Naked Conversations, on- going and uncontrollable---the simple conversation. And if it's deeply personal, it's universal. As Red eulogizes , in Shawshank,"Get busy blogging (sic) or get busy dying". Blog or die? The chaotic order of it all. The mess is the message. The "C" word was a feeling, an attitude. The "U" one (ubiquitous) is a verb---you have to do this thing. I play poker, and the way I do chips is the way I do life, in black. It's the equivalent of wearing sunglasses, besides it keeps me ninja-like and noncommittal. I don't buy, I wear clothes. I don't buy books either , I read them in the"showrooms"--- Barnes and Noble. and buy them online,like Starbucks, that a 3rd place where you just want to be. It's not home, not work, for meeting and greeting people, having coffee, bumping into the unexpected, not just paper and ink, but edutainment. Let me tell you about the last book I bought retail---back in the Middle Ages of 1995! when Netscape had a 90% piece of the mind share in the browser wars. I was in Stockholm, Sweden, January 1995 in the upscale Kungsholmen district. on a temporary visa, about to get a guided tour in new media from serendipity. A MAC user back then, on top of the world like some alpha geek, with what now seems like digital obesity, a fat heavy duty 5200 Power Book;(given the next topic I'm about to talk about---the lean and mean Cell Phone as Swiss Army Knife.) with an @ behind my name courtesy of hotmail.com, I was hooked on Silicon crack, with "free"web-based e mail, they "got me" while I was young. Being Digital (photo). was in the store window like some stuffed animal in the zoo. I went inside to get warm and have a look. I wanted to read that book. just to be able to open its pages, "Yarg kawmer frawn USA", but this was Northern Europe, where you have to pay for even the water in a restaurant. I was in Stockholm and about to have a bad case of Stockholm syndrome, the bonding of and captive,---the "Swedish" way was kidnapping my "one market under god" value system, and it actually made sense to me-they hijacked my right to browse. When you walk in a swedish book store, you are held hostage until you buy something. It's a twist on the "If you break it, you buy it. In this case, if you open it up, you buy it. The sign should have read" Don't feed the animals". Instead it read, "Please don't open the books" (No kidding). In fact, most were covered in cellophane . I had a hard time suspending my disbelief. Try before you buy was like drinking the milk without buying the cow I suppose but I am lactose intolerant when it comes to information, it has to be free so the mantra goes. I immediately ripped the packaging off, like it was my American consumer birthright right "to browse", the gold standard, the reason why the "axis of evil", the 2 Billion people on this planet who make less than $2 Bucks a day, hate us. They'll have their revenge, by leapfrogging the technology and burying us in twenty years. 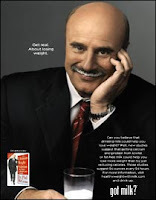 Here's some BADvertising---Dr Phil, a bald woman in drag, talking smack about men on Oprah. He's Got Milk! But has he ever bought a cow? I did a preemptive strike---"I'm buying it. I'm buying it." my quo needed some status, that of customer queuer upper. I stood in line, single file. 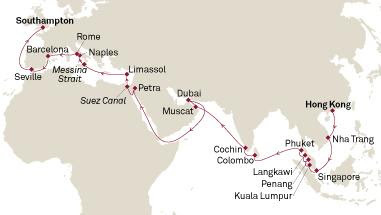 Ready to check out. I managed to scan the first chapter, The DNA of Information, and still kept my options open---We can do that in America, return things. It's like getting something for nothing, a little larceny to it all. I got a jolt of patriotism , thinking about wasting time, money and opportunities in the United States of Unconsciousness. by shopping at WalMart, eating at Burger King and causing the second Gulf War by driving my high octane Jeep Cherokee.---I missed road rage, traffic and returning stuff without a receipt.I wanted to secede, and no longer be part of the Round Planet, and revert back to that other species---American. Few things are harder to put up with than a good example. Now, I had to behave like one of those Post-modern, degenerate, trendy, out-of-style Euro trash with avant-garde high art manners, and a tendency towards procrastination. When I said, "Excuse me" She said. " I have no excuse". Like the meaning of life, I felt like I had to get one. Pony up, like Nike says "Just Buy It". I wanted to take as much dough out of this place, and now I felt like I was money laundering. I bought Being Digital with that monopoly Krona. Buying the book was not just to be a run of the mill transaction. I couldn't return it! That was transformational. That meant I would have to carry it around, like some anchor. It might even tip the scale at the airport, and cost me $50 extra bucks--You know baggage. I didn't really do that thing well. Oh well, it survived the flight home and later re-purposed Being Digital as a used book, at Fred Bass' Strand Bookstore in Greenwich Village, New York. It was the paradox of that book, any book for that matter. Pulp(less) fiction and the future of paper.I was thinking. Wow this is already dead information. I needed subscription-based publishing, that I can log-into, in real time for instant updates. I couldn't string that sentence together back then. All I could think about was how dead it was, like buying a car, right off the lot, it depreciated, built in obsolescence. The good old American novel, wasn't broke, but I didn't have the foresight to realize if it wasn't broke, you had to break, and not only that break it before someone else did, like Shawn Fanning with Napster, who made it easy to download and impossible to pay for. Props. I did judge this book by its cover. The "C" word was in Vogue; Cyber this and Information SuperHighway ---Al Gore'sthat. E Bay or not to Bay. Everything that could would be digitized and copyright was copy wrong. Finally we were going paperless, and stop killing the trees, the red wood forests. This land was made for you and me. AMeriCANs not AMeriCAN'Ts. The copyw as just as valuable as the original. Nick wrote it then and it means more now---"The access, the mobility, and the ability to effect change are what will make the future so different from the present. "(p.231) And digitization will increase dramatically with each generation becoming more digital than the preceding one. Being digital is not about the future: "It is here. It is now." This web 2.0 future is already here, it's just not evenly distributed yet. Unless you have a cell phone. The U (you) in User Generated Content rises and falls on that all-in-one , double-duty Swiss army knife---your cell phone. It's ubiquitous! It is not just a "yell" phone, not just something to wear as a blue tooth fashion statement to annoy people while waiting at the ATM machine for your yuppie food stamps (The Hamilton's). The cell phone is the defacto gold standard in digital convergence:The phone is a camera,. The phone is an mp3 player. The phone is a digital video camera. Phillips has brought TV-on-cellular chip set to the US , and now,a book? 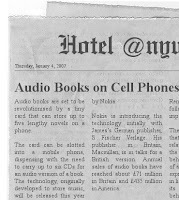 Audio books are set to be revolutionised by a tiny card that can store up to five lengthy novels on a phone. With 65 million iPods sold to date And that's just iPods, imagine how many people who listen and who don't read, now t can listen to books too. I drive a car, does that make me combustible literate.? I use a laptop, does that make me computer literate? Does it matter anymore, at this point.